It has been a conundrum since the first electric powered washing machine was invented in 1908 - why is there always a missing sock? Well, I have found the answer. That is right, I know where they are! The tango in the washing machine is the closest thing to excitement for clothes. They dance back and forth, jeans holding hands with shirts, undies rubbing up against bras! It is simply titillating stuff. As for the socks, the soft soapy beautiful bubbles bouncing them around must be a place of complete joy compared with the stinky, tinea ridden feet they usually get up close and personal with. Think about it. Where would you rather be? It is no wonder they don't want to leave the safe sanctuary of the washing machine. As soon as the door opens on the front loader and the light shines in, the socks scatter to find any crevice where you won't find them. They are petrified that you will return them to their mate, chuck them back in the drawer to once again be shoved into a stinky old shoe. 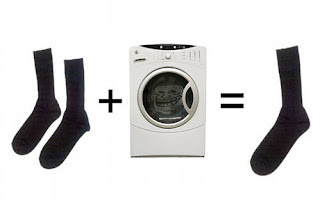 Once they have broken free, they live a wonderful life in the bowels of the washing machine with the other freed socks. They lie around in there producing untold amounts of lint for the rest of the clothes that come and go in the washing machine on a weekly basis. Don't fret for the single missing/freed socks because they are happy. Very happy in fact not having to deal with foot fungus, toenail rot, bunions, or athletes foot ever again. Where would you rather be? on someone's foot or dancing the tango in the washing machine? You make a good point here Sam. But seriously it drives me absolutely batty! Hey Jodi! How are you? Drives me completely batty too. I have even lost one of my son's socks, he wore them once and is 13 weeks old! Do you think they would come back if I promised to dance with them? I have no idea! I was just putting away my daughters washing and 2 were missing!